Beyond Seen Screen makes any video interactive and engageable. The service BSS provides is two-fold. On one hand, it provides viewers with additional ElementsInformation, entertainment, commercials, etc. linked to the video content they are watching. On the other hand, it allows production and advertising companies to unleash creativity and engage viewers with their content in new ways. And as a byproduct, generate new revenue streams. But are viewers really interested in the additional ElementsInformation, entertainment, commercials, etc. related to the video content they are watching? For movie production company this means that anybody who watches trailer on any TV station, even if they watch it on YouTube, Vimeo, Dailymotion, on any other screen, when they use BSS application they will get ElementsInformation, entertainment, commercials, etc. that will guide them to get additional information and even to buy tickets for those movies. Added value can be added to every single video you have. There you can provide information plus trailers for new movies (e.g. BSS-ing Marvels Iron Man can show new trailer for Spiderman Homecoming), and of course if applicable to already pre-reserve their ticket. You could also do sweepstakes, prize games, giveaways... anything. How does Beyond Seen Screen work? Here is a quick diagram that explains this simple process. Viewer uses their smartphone to scan the video they are watching. The platform recognizes the video and provides the ElementsInformation, entertainment, commercials, etc. the content owner linked to it. These ElementsInformation, entertainment, commercials, etc. are presented to the viewer on their smartphone app. You are a chef and you have a cooking show. It spans several seasons and in each episode you do three recipes. All the recipes for dishes that you prepare in the show are on your website. You have partnered with some grocery stores in some regions of the world and you can provide direct shopping lists in those stores for groceries required to prepare that exact dish. You have a contract with a cookware company whose products you promote. You also wrote a book that you are selling. And you have restaurants in several cities around the world that you want to promote. 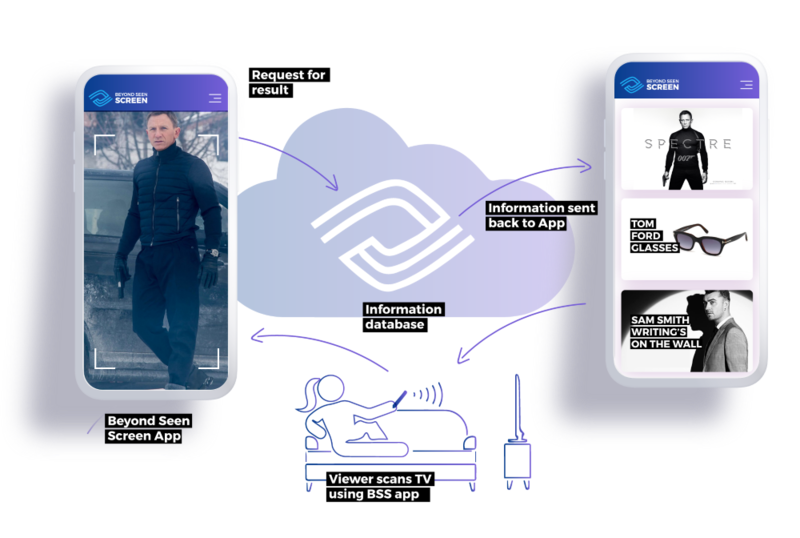 With Beyond Seen Screen, you can link all of this information together and provide it as ElementsInformation, entertainment, commercials, etc. on all your cooking show episodes. You can provide direct links to exact recipes that are being displayed at the time the viewer scans the video. You can provide links to web shops for the cookware you promote and use in your cooking show. Viewers would also enjoy the bloopers made during recording the shows. Luckily, you uploaded those bloopers on your website and you can now provide a link to the exact bloopers that occurred during that episode. If a video is scanned in a segment between the two recipes, you can provide some general information about yourself and your brands. Maybe also a link to your new book that was just released. You can leverage geolocation feature of the platform and provide the link to make an online reservation for a table at your nearest restaurant. For end viewers, all it takes to get to these ElementsInformation, entertainment, commercials, etc. is to start the BSS app on their mobile device and use it to scan the episode of your show they are watching. And since they scanned the video, they are interested in what you have to offer. Users of BSS application, your customers, will be able to login in to BSS application which will grant them options for sharing and looking into history of their past ElementsInformation, entertainment, commercials, etc..
With this you get even more exposure for your video. They can share it to somebody who did not even see the video and they will still see these ElementsInformation, entertainment, commercials, etc.. It brings exposure and cool factor to your brand. As Beyond Seen Screen client, you get access to the Client portal where you can manage all your videos and their related ElementsInformation, entertainment, commercials, etc. in one place. After you log in with your credentials, you can start building your ElementsInformation, entertainment, commercials, etc.. When you are ready, you can publish your ElementsInformation, entertainment, commercials, etc. to the world. Now whoever wants to get ElementsInformation, entertainment, commercials, etc. from your videos, they can just start BSS app, scan the video and engage your content. If you haven't yet left your email, do it now or miss on the greatest app of your life. Or just stay up to date with our news. Thanks!